Import/Export orders for any type of products like simple/simple with custom options/configurable/grouped/bundle/downloadable/virtual. Import orders with any shipping methods even if it is not enabled and/or doesn't exist in store at the time of import. Import orders with any payment methods even if it is not enabled and/or doesn't exist in store at the time of import. It creates Invoices, Shipments and Credit memo at the time of import. It works for exporting orders from older Magento version and Importing exact same orders on newer version. 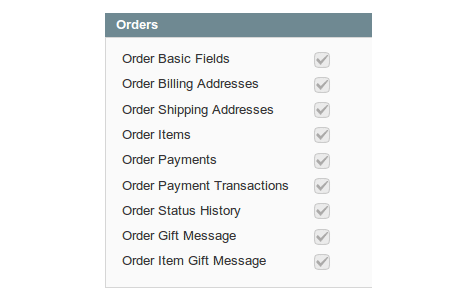 Admin have options to export only selected orders or all orders. Import orders to specific store view. Provide an error report for orders which fails to import with order number and error detail. This extension can use to import export orders with invoice, shipments, credit - memos, comment history and transaction using XML and CSV File. Only magento to magento orders data migration is possible using our extension. You can upload your exported CSV/XML file from here. Our extension allow CSV/XML file format so you can manage it easily. Choose uploaded or already exists csv/xml file from Choose Import File. 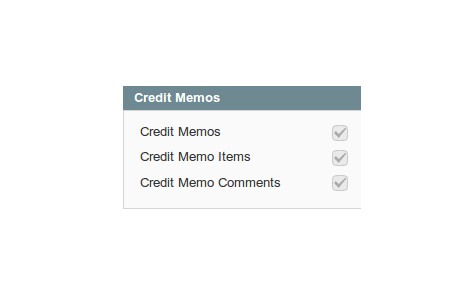 You can choose Import Behavior whether you want to Append new orders or Delete orders. If any issue found in your csv/xml file then all the errors will be display with order number and error detail. We bifurcate errors in two sections, Major and Minor. If you not fix minor error then it will allow you to import the orders but in major error you must fix the issue. After import orders its detail will be display. Even if any error occur during import then it will also display with order number and error detail. Use CSV/Tab Separated or XML (recommended) formats in which you want to export orders information. Export Orders using Order status. Export Orders using Order placement date. Export Orders using Order number. Export Orders using Customer ID. Orders basic fields, Order billing / shipping addresses, Order Items, Order payments, Payment transactions, Order status history, Order Item Gift, Order Item Gift Message. 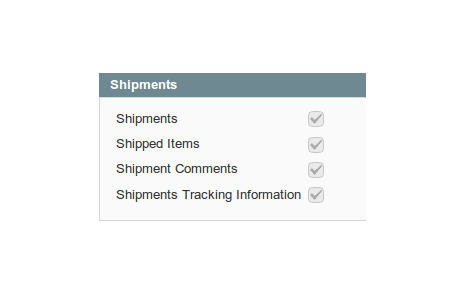 Shipments information like Shipment , Shipment comments, Shipped items, Shipments tracking. 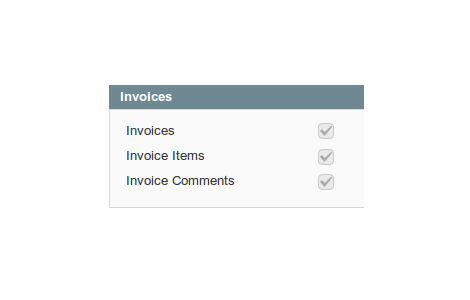 Invoices information like Invoice, Invoice Items, Invoice comments. Credit Memo information like Credit Memo, Credit Memo comments, Credit Memo items. See a history of exported Orders. Unlike other import/export modules, this one really works and also imports the invoices, payment methods and shippings. Greatly well reinforce, we appreciate it! Import 5000 orders in few hours exceptionally rapid. Simple establishment and it works great. Much obliged to you for sharing. Works great! Much thanks for sharing this module. Great tool. Easy to install and configure. We want to export orders from the old magento and import it in new magento. this tool work as we want. => Import Export all Orders data from one magento to another magento store. Q-1: I have installed Import Export Orders Extension Using Magento Connect Manager. But When I am login into my magento admin then it will give blank page. Ans : This type of issue occurred when Compilation is enabling in your magento store. Please disable our extension from/app/etc/modules/CapacityWebSolutions_ Importexportorders.xml file. For disable our extension by settingfalsetag in the above mention file. Please Re-Compile your magento store. Once Re-Compilation is completed then enable our extension by settingtruetag. Q-2: How i can import with all customer details (each billing and shipping address)? Ans : For all customer details, you have to use default customers import/export functionality. Go To System -> Import / Export -> Dataflow – Profiles. Use Import Customers and Export Customers. Note: Before start import orders process, you have to import all customers. Q-3: Order showing different date/ time. , What i have to do? Q-4: Order showing store as deleted in grid and order details? Ans : This is happening due to store code does not exist. Make sure you used same store code and assign to same website as original website have, for same to same order import. 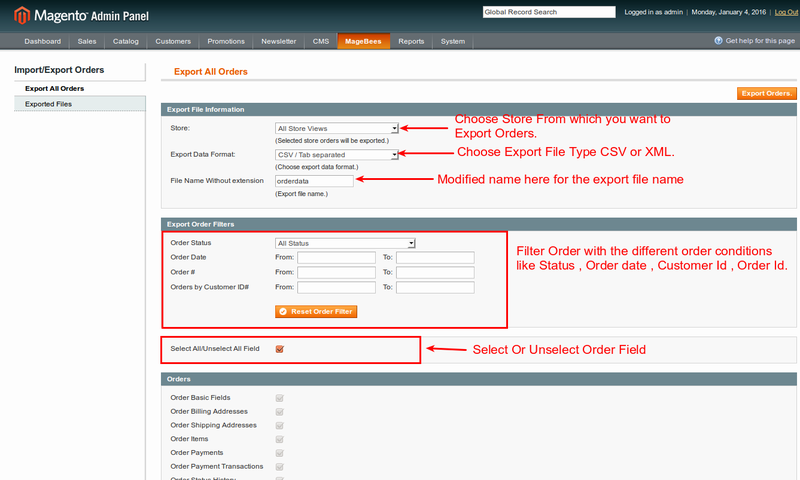 Q-5: What is Use of “Try to Import Orders to Corresponding Store Views” drop down when import Orders? Ans : When you import orders and there is no any related store available in the new Magento Instance then import orders in the selected drop down store view. If you select No from the “Try to import Orders to Corresponding Store Views” and if there is no any related store view then order will be assign as deleted store view. Q-6: Order not showing Payment Method label same as original website have it? Ans : This is happen due to payment methods configuration. You can set payment methods label in System > Configuration > Your Payment Method configuration. Set label according to your requirement. Q-7: After importing new Order it will not open and display The Requested Payment Method is not available? Ans : This is happening due to payment method is not installed in your new site. So you need to install Payment method in this setup. Q-8: I am getting max execution time error, what i have to do? Q-9: How many validation log and import log, can i see? Ans : You can just see last validation and import log. If want to keep validation/import log, then you can export it from validation or import tab in CSV format. Q-10: I am getting “‘var/export' directory does not exist!” error. Ans : This error comes due to var/export directory does not exist or not having write permission. Q-11: I am getting “‘var/import' directory does not exist!” error. Ans : This error comes due to var/import directory does not exist or not having write permission.